Suitable raw material: cobble, rocks(limestone, granite, basalt, diabase, andesite etc. ), ore tailings and sand making of aggregate chips. mine, coal mine, waste and construction waste recycling, cubic meter of earth and stone project, urban infrastructure, road and building construction. Material preselected by the feeder, and the VSI impact crusher makes the sand production. A closed-circuit system is formed through the vibrating screen, which realizes materials cycle broken and can reduces processing sectors effectively. The final material is discharged by belt conveyor to make continuous crushing operations. 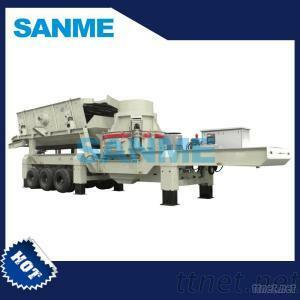 Structural composition:All parts of the vertical shaft impact mobile crushing plant are fully vehicle-mounted including: solid frame, vertical shaft impact crusher, feeder, vibrating screen, belt conveyor, motors and control boxes etc.